Imagine that you get in the balloon and start floating slowly, getting higher and higher. Our target is the stratosphere, where we can see the roundness of the Earth, and a real black starry sky above us. This is where intermingle two environments - the Earth's atmosphere and the cold, silent and almost inaccessible space. The music on the album is the musical illustration of the expedition to the border of two diffrent worlds. Moments of calm and melancholy change here in strong accents when our balloon is torn by a turbulent jet stream. When we get to the destination music will soothe us once again with calm chords in a familiar style we already heard somewhere. Music by Józef Skrzek and Przemysław Rudź combines also the two musical worlds. Józef Skrzek, the legend of progressive rock, the leader of the famous rock group SBB, who with his inseparable Minimoog also brought a lot to the Polish electronic music. Przemysław Rudź, composer of the younger generation, the successor and continuer of the Greats on el-music scene. The possibility of artistic cooperation with such respectable personage inspired him to compose the suite addressed to demanding and sensitive listeners. The stratospheric music. 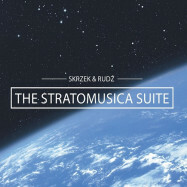 The Stratomusica Suite!